The Kamloops real estate market is affordable. Housing costs are roughly one half less than a comparable home in the Greater Vancouver area. 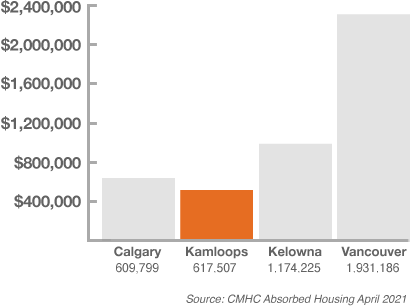 The Canada Mortgage and Housing Corporation reports the average price for a single detached home in Kamloops for the second quarter of 2015 as $380,000. The Kamloops area has several master-planned residential resort communities that offer such benefits as lake and alpine views, riverfront access and award winning golf. They include: Orchards Walk, Rivershore Golf & Estates, Sun Peaks Resort, Sun Rivers Golf Resort, andTobiano Living.